The characteristic area of Lungaserra consists of big blocks of very solid gneiss polished over the ages. It is situated in the woods uphill of the village of Barge and offers pleasant climbs ranging from 5c to 7b. These crags are climbed best during the hotter months, in the cool shade of the chestnut trees. The crag hosts circa 150 routes on various large boulders which include, above all, the NW - SW facing Masso di Sinistra, Masso di Destra and Masso dei Folletti del Bosco. Reach the crag by driving from Saluzzo to Barge (20 km). Continue on towards Paesana and reach Mondarello after 1km. Turn left off the main road and follow the narrow Lungaserra street for circa 1km to reach Lungaserra. Park here and follow the obvious path through the steep forest. This narrows down into a track and leads to the crags in circa 20 minutes. The Monviso Rock Climbing Festival will take place on Saturday 6 and Sunday 7 October 2012. The meeting is open to all those who wish to sample the delights of rock climbing in the Po valley. Click here to find out more. 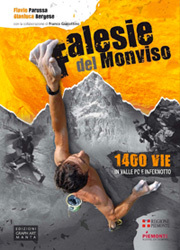 Falesie del Monviso: 1400 vie in Valle Po e Infernotto by Flavio Parussa, Gianluca Bergese, Franco Giacottino. Graph Art, 2010.